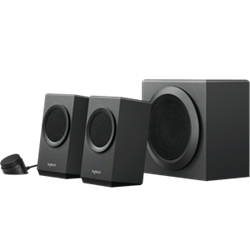 EF-E10BT, Edifier E10BT Exclaim - 2.2 Lifestyle Studio Speakers, Bluetooth Details: Producing crisp highs and mids while delivering rich lows, Exclaim Connect is ideal for PC/laptop audio. With a unique look that seamlessly blends smooth curves and straight lines, this bookshelf speaker is also the perfect accessory for your desktop. Each satellite houses 3 active speaker drivers and 2 passive radiators, maximising audio performance. The upper section of each satellite contains two 1½ midrange/tweeters and a 1½ by 3 passive radiators. While the base section contains a 3 woofer and a 3 passive bass radiator for rich, powerful bass.